The increasing demand for fuel efficient vehicles, along with the introduction of stringent emission norms and regulations by governmental bodies, has led to publish this timey report. The gaseous alternative fuel vehicle is expected to flourish in the next few years because of depleting resources of traditional fuels along with low cost of gaseous fuels and also supportive government initiatives along with substantial investment in the improvement of fuelling stations is expected to feed through in the latter part of the decade driving growth to new heights. If you want to be part of this growing industry, then read on to discover how you can maximise your investment potential. The key player assesses that the global alternative fuel vehicles market will reach a value of $313bn in 2017. • Do you need definitive alternative fuel vehicle market data? 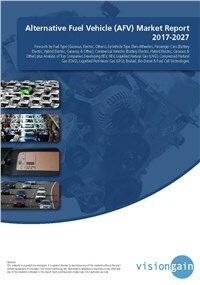 • Succinct alternative fuel vehicle market analysis? • How is the Alternative Fuel Vehicle Market evolving? • What is driving and restraining the Alternative Fuel Vehicle Market dynamics? • What are the market shares of the Alternative Fuel Vehicle Market submarkets in 2017? • How will each Alternative Fuel Vehicle submarket segment grow over the forecast period and how much revenue will these submarkets account for in 2027? • How will the market shares for Alternative Fuel Vehicle submarket develop from 2017-2027? • What will be the main driver for the overall market from 2017-2027? • How will the market shares of the regional and national markets change by 2027 and which geographical region will lead the market in 2027?